Princeton Junction (signed as Princeton Junction at West Windsor) is a railroad station in Princeton Junction, New Jersey, located in West Windsor Township. It serves NJ Transit (NJT) and Amtrak on the Northeast Corridor (NEC), and NJ Transit on the Princeton Branch. Princeton Junction's origins can be traced back to the United New Jersey Railroad and Canal Company, the predecessor of the Pennsylvania Railroad in the 19th century. The original station was built in 1864, in preparation for Princeton Branch service to begin in 1865. Albert Einstein, who lived at 112 Mercer Street in Princeton, used to enjoy sitting at the station and watching the trains go by. More than once, he employed trains to explain the practical effects of his General Theory of Relativity. In 1965, a prototype for the high-speed Metroliner passed through the station at the record speed (at that time) of 164 miles per hour (264 km/h) on a short demonstration run. Very few sections of the Northeast Corridor were capable of handling that speed, and most had to be upgraded before Penn Central's Metroliner service was introduced in 1969. A speed of 170.8 mph (274.9 km/h) was achieved on the same portion of track on December 20, 1967, when the U.S.-built UAC TurboTrain set the rail speed record in North America. A plaque at the station commemorates the event. The present station house was built in 1987. Most of Amtrak's Princeton Junction service prior to 2005 was Clocker service commuter traffic to New York, Newark, or Philadelphia. On October 28, 2005, the Clockers were replaced by NJT trains that run only as far south as Trenton. Princeton Junction has been designated the core of the West Windsor transit village, a smart growth initiative to promote transit-oriented development which can include government incentives to encourage compact, higher density, mixed-use development within walking distance of the station. Development adjacent to the station permits higher densities and will include retail end entertainment elements. As of 2017, Princeton Junction was the 6th-busiest station in the NJ Transit rail system, with an average of 6,817 weekday boardings. In addition to the Northeast Corridor Line, NJT operates a 2.7-mile (4.3 km) spur line, the Princeton Branch, to Princeton station located at the Princeton University campus in Princeton. The shuttle is colloquially known as the "Dinky", and has also been known as the "PJ&B" (for "Princeton Junction and Back"). Two train cars, or sometimes just one, are used. A single switch connects the branch to the Northeast Corridor tracks north of the station. Amtrak provides two early-morning trains to Washington, D.C., and two evening returns, as well as one morning train to Harrisburg, Pennsylvania and one evening return, all of which call at Philadelphia. Many more Amtrak trains stop at the nearby Trenton Transit Center. Until 2007, all Amtrak Pennsylvanian trains stopped at Princeton Junction. The southbound Amtrak Palmetto began stopping in Princeton Junction in October 2015. The Central Jersey Route 1 Corridor BRT is a proposed bus rapid transit system which would use Princeton Junction as its hub. The station has two high-level side platforms. Most of Amtrak's Northeast Corridor lines bypass the station via the inner tracks, except for select Keystone and Northeast Regional trains and the once-daily Palmetto. The next northbound station is Jersey Avenue, but all northbound trains originating in Trenton skip this station and service New Brunswick, with other trains originating at Jersey Avenue. ^ "Princeton Junction". New Jersey Transit. Retrieved December 17, 2016. ^ a b Kiefer, Eric (February 21, 2018). "Here Are New Jersey Transit's Most, Least-Used Train Stations". Patch.com. Retrieved October 15, 2018. ^ "Amtrak Fact Sheet, FY16, State of New Jersey" (PDF). Amtrak. Retrieved October 13, 2017. ^ Messer, David W.; Roberts, Charles S. (2002). Triumph V: Philadelphia to New York 1830–2002 (PDF). p. 89. ^ Frassinelli, Mike (July 17, 2010). "Proposal to replace Princeton's longtime 'Dinky' train with bus line saddens sentimental locals". The Star Ledger. Retrieved May 9, 2012. ^ "Dedication of plaque commemorating high speed rail in America". National Capital Land Transportation Committee. ^ "High speed rail commemorative plaque in Princeton Junction station". www.ns3010 .rrpicturearchives.net. ^ "Princeton Junction, NJ". Great American Stations. Retrieved April 27, 2016. ^ "West Windsor gains Transit Village designation Township becomes 24th Transit Village in New Jersey" (Press release). NJDOT. January 5, 2012. Retrieved May 25, 2012. ^ "An Unofficial Transit Village". The New York Times. October 9, 2011. Retrieved April 27, 2016. ^ "Princeton University: Train Travel". Princeton University. Retrieved October 9, 2011. ^ "Central NJ Route 1 BRT" (PDF). NJ Transit Bus Service: The Next Generation. New Jersey Transit. April 26, 2010. Archived from the original (PDF) on October 13, 2013. Retrieved March 30, 2012. 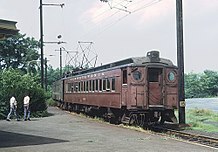 Wikimedia Commons has media related to Princeton Junction station.